A queen is a person of royalty, and it's not unusual to dream of queens and kings or even princesses and knights in our dreams. 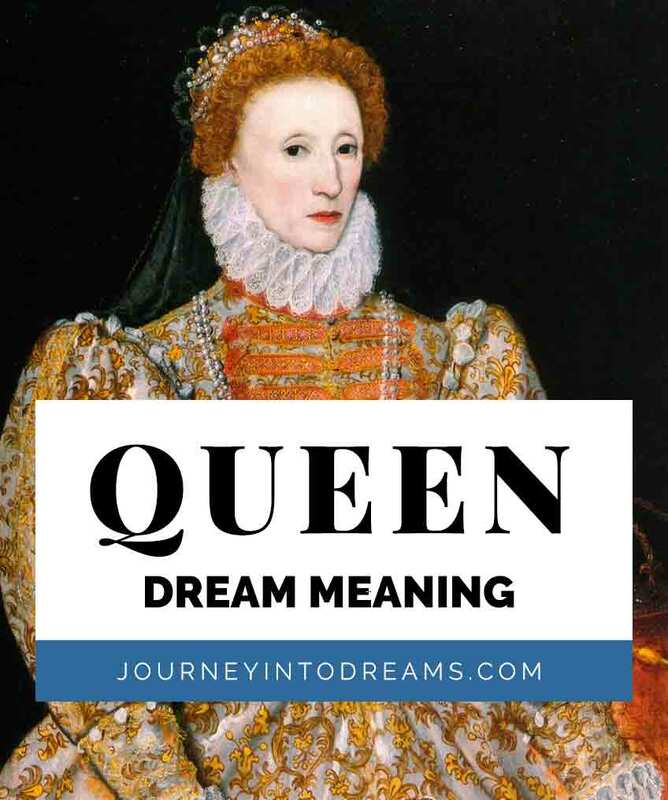 Understanding the meaning of a queen in our dreams can help us discover quite a lot about ourselves and how it applies to our current waking life. What Does it Mean to Dream of a Queen? A queen in our dreams often signifies feelings of power and being in charge. We often see queens as majestic leaders of a nation or empire. Royalty in our dreams can be a sign of feeling like we are deserving better in our own lives or it can mean that we are feeling like we are on top of the world. The queen is a symbol of strength and power. If you dream of this symbol, it could mean that you are preparing to lead the way into victory in some aspect of your life. Are you kind and benevolent in your leadership of others, or do you behave like a cruel dictator? Do you feel as if you are a worthy leader? Sometimes this dream symbol will appear when you may feel like you are not as fully in control as you would like to be. A queen can also often be a character archetype in our dreams - see types of people in dreams to understand more about dream archetypes. In this dream meaning, You may feel as if others look up to you, or that you have a responsibility to do what is right for all people, not just yourself. You may feel an unexplainable urge to help others and to help them see the big picture of where they are in life. You may be involved in a number of humanitarian causes, such as equal rights for all and the fair and humane treatment of animals or people. Many people associate Mary as the Queen of God, and it can be a symbol for some to tap into their spiritual gifts or explore their spirituality in more depth. Often times, we see this manifesting as miracles in our own lives, and we hold a great sense of nurturing, respect for life and a feminine aspect to ourselves. Dreaming You are a Queen: This could mean that you have a desire to be in charge. It can mean that you feel called to be a leader and to lead others into victory or a better situation in the world. Dreaming of Being a Servant to a Queen: You may feel like your talents are going unused or that you are not fully appreciated for who you are. You may feel as if you are serving others in some aspect of your life. Running Away from a Queen: Dreams of being chased are common, and often are a symbol of being afraid of something. You may be worried about taking on new responsibilities or stepping into a leadership position in your career or other event in your life. Beheading by A Queen: If you dream of being beheaded by a queen, or a queen shouting, "Off With Their Heads! ", it could potentially mean that you feel as if you are being treated injustly or that you are being punished. You may not be fully seeing the truth in a situation. Queen of Hearts: If you see a queen of hearts playing card, it could mean that you are feeling in power and are trying to decide what is just and fair for all. You may be unsure of whether to show the truth to others. In order to best understand what this dream means, it is helpful to pay attention to all of the details of the dream. These little details can give you subtle suggestions for the true meaning of this dream and help you learn to interpret dreams effectively. Where did the dream take place? Did it happen at a large majestic castle full of intricate architecture? Or were you in a large arena? Did the setting of the dream take place at night or in the daytime? Did you see clouds in the dream? Take into account all of the details of the setting, such as time and place. Who was in the dream? The people in the dream can mean many different things. Sometimes these people we dream about may actually may be actors or actresses starring as ourselves! What Other Symbols Stand Out? For example, if you dream of the queen riding a horse, or you riding a horse to run away from a queen, you may want to look at the meaning of horses in dreams. The more you pay attention to these other details, the clearer the dream interpretation will be! What was your mood? Often times our overall feelings and mood while we are dreaming can give us a lot of information. If you feel happy and peaceful in the dream, this of course is a very good indication of feeling happy and peaceful in life. On the contrast, if the dream is a nightmare and you have feelings of fear or sadness it can mean that there is something in your waking life that is troubling you. Have you had a dream about queens or other dreams that involve royalty? Tell us about your experiences in the comments section below!